My Elvis collection consists for a substantial part of recordings where Elvis had nothing to do with: imitators, tributes, impersonators, parodies and covers. There is so much of it, that I could easily dedicate this whole blog to Elvis related recordings. Probably such a blog already exists; if you know where it is, please let me know! 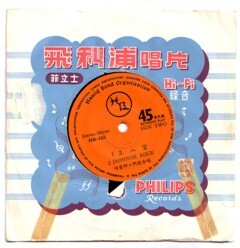 Among my favourite finds is a Chinese 45, that I bought because one of the titles on the label is Jaihouse Rock . I think that it is a group of comedians, who made this recording in the 70’s. It takes several minutes of Chinese conversation before Jaihouse Rock starts, and I am the first to admit that this version is beyond underwhelming. But don’t make any effort to try and buy this record from me: it is not for sale.